In the lead towards the virtually expressive and yet to be understood fully quantum physics, men have created many devices in order to test theories in experiments, in order to find answer to most of their doubts in mind about how this universe works from the simplest form of matters and particles. 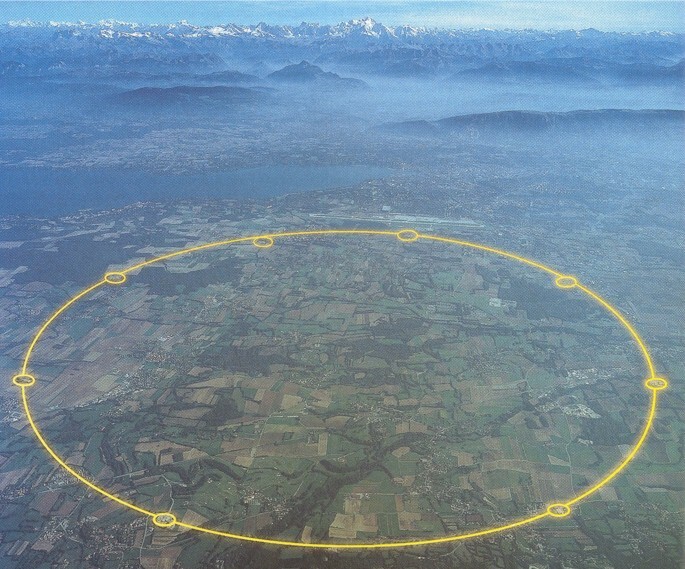 So these bunch of 10,000 engineers and scientists from over a hundred countries gathered around and plan for this supersize energy accelerator, and they named it The Large Hadron Collider. With 27 km in circumference under Geneva's soil, this underground thing sure is very big. Apparently the UFO parking plan was rejected by the JPJ. Probably the largest washing machine motor ever created by men. The large Hadron Collider is a massive particle accelerator used by physicists to study the smallest known particles in order to study the classic high-energy physics. Two beams of subatomic particles protons or lead ions will travel in opposite directions colliding the two beams head-on at very high energy. Some people are afraid that it will create strange matter which turns everything it touches into strange matter meaning everything, miniature big bangs. Some of the top physicists expressed their concerns on what the collider may produce, which in their believes the collider may just turn matter into antimatter or create out-of-a-sudden state-of-the-art supermassive blackholes where we all are going to be sucked into and compressed into a state of form so dense that the dying part must be interesting to study, or worst create a godlike explosion due to the high-energy collision of particles, few hundred times than that of a plutonium bomb. Or maybe create a few numbers of parallel universe that mirrors the exact earth somewhere in the other part of space, only that in that universe your life somewhat is more fortunate, or the alternate. Or maybe, due to the energy it creates,at such a superhigh speed, we'll eventually travel back to time. Grandma's wedding will be attendable once again. But I believe the subatomic particles collision that leads to explosion is somehow very, very disturbing upon reading up the facts and studies about how much energy can be gathered from such small elemental particles. In the search for answers, them mad scientists turn earth into sun. Hilarious. Picture this: the energy inside your pasar-malam wristwatch is ample enough to at least destroy Southeast Asia, if all of it is used at 100% efficiency and at amplified course. So don't underrate small particles, son. They're just don't behave like the way they look. So, Hadron collider visit, anyone? Anyone?